Home » Interviews » Ninfa Cruz: "I ask for freedom for all Colombian women taken"
Cruz has been defending the rights of women in Colombia for more than 15 years. He is currently in Europe, specifically in Barcelona. What is the reason for this visit? I want Europe to know the problems and the violation of human rights, especially towards women, that are living in Colombia. President Ivan Duque is saying that Colombia is a retreat of peace and this is a lie. In Colombia you are a social advocate for human rights for decades. How do you understand this role? I assume this role as a responsibility. It's a tedious way. My role can not be done by anyone. I took the determination to denounce the violation of rights in Colombia. Many women are afraid of raising their voice. I do it on behalf of all of us. In what moment does your fighting career begin? My fight begins when the Municipal Association of Peasant Users (AMUC) and the Departmental Users Association of Peasants (ADUC) disappear. They were exterminated by crimes committed by the military, state security agencies and paramilitary groups. Dozens of social leaders were forced to escape from the risk of being killed or missing. I have suffered up to five journeys forced by threats against my physical integrity. I have been forced to live in hiding because my life was at risk and I have survived an attempt to disappear in Bogota. But this has not wished me to continue denouncing all the dramatic cases that the Colombian state is perpetuating. He is currently a member of COSPACC. What programs are coordinated and what is your mission in this organization? I am the founder of COSPACC, a human rights NGO that works in the eastern part of Colombia, in the departments of Boyacá, Casanare, Cundinamarca, Tolima, Santader, Arauca, Villavicencio and Bogotá. 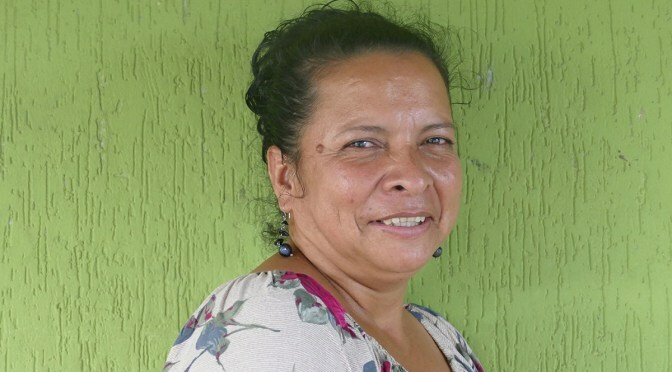 I am also a member of ASMUC, 'Asociación Mujeres Unidas del Casanare', ASONALCA, 'Asociación Nacional Campesina Jose Antonio Galán Zorro', ANJECO, 'Asociación Nacional de Jóvenes y Estudiantes de Colombia' and ASOTRAVID, 'Asociación de Trabajadores por una Vida Digna'. They are organizations that are part of the People's Congress and the Ethnic Popular Agrarian Summit. 15 years ago I am the women's leading advocate. And what do you do in these organizations? What is the situation of women in Colombia? Many women rights advocates are being murdered to claim decent housing and the right to education. Other women are taken and detained, accused of terrorism to defend social justice. What do you demand as the women's rights advocate? I ask for the freedom of women taken. I ask for the freedom of Alix Miriam Aguilar Marín and other companies that are in prison to demand respect or to want to defend the environment. I ask for freedom for all those women who are not terrorists, as the state says. They are field workers. I ask for the freedom of Carmen Idaida Salcedo, of Maria Teresa Rincón Duarte, Yulivel Leal Oros ... I ask for the freedom for all the women taken from Colombia. Is there no law that embraces women? Many women in Colombia are murdered by their husbands. There is much feminicide in Colombia, a lot of sexist culture. We have mobilized women and mobilized ourselves to demand our rights. They stigmatize us, persecute us, move us, criminalize us. What is left of all these years as a social leader? As a defender of human rights and a social leader I have the fight to continue accompanying women to see the situation that is taking place against us. We will continue to fight to ensure that women's work is respected and valued. Many of these women taken are peasants, they are workers and not terrorists. Being a social leader is not a crime. The state criminalizes women. Speaking of the Colombian state ... The negotiations and peace agreements with the FARC and the ELN are being breached. What is your vision about it? At the negotiating table, all parties signed an agreement. The State promised to offer, to these groups, rights and relocation. Instead, the state has been dedicated to killing people who were part of these armed groups as a retaliation. These people have had no choice but to return to the mountains for not being killed. The war has tightened up and Colombia, I repeat, is not a retreat of peace as the government wants to sell. Colombia is still worse.